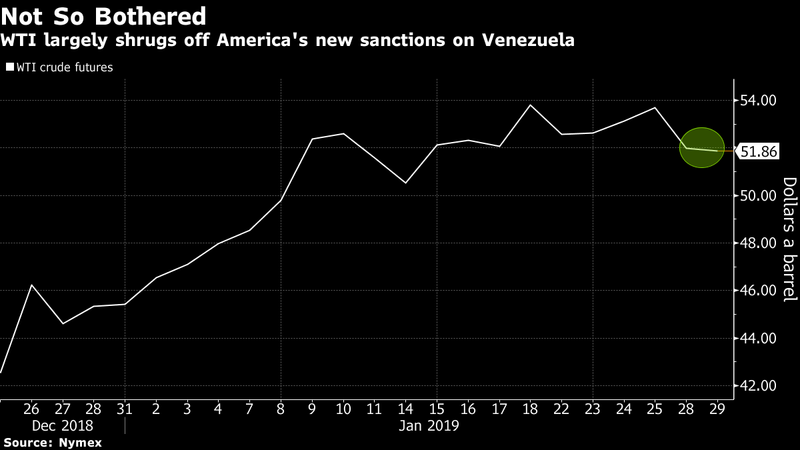 The Trump administration issued new sanctions on Venezuela’s PDVSA that effectively block the regime of President Nicolas Maduro from exporting crude to the U.S.
PDVSA is the state-owned oil & gas company. Venezuela has the largest oil reserves in the world. The U.S. recognizes National Assembly leader Juan Guaidó as interim president of Venezuela. 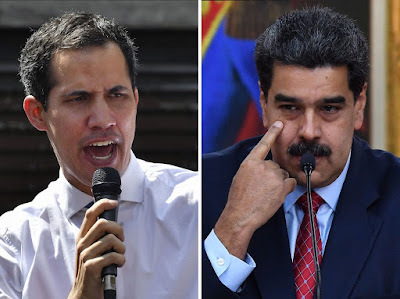 Guaidó has promised to host free and fair elections. The Trump administration announced it is blocking all U.S. revenue to Venezuela’s national oil company and called on members of the armed forces to switch their allegiance to Juan Guaidó. Juan Guaidó, left, and Nicolás Maduro are locked in a confrontation over the right to govern Venezuela. Oil has advanced 14 percent this year as the Organization of Petroleum Exporting Countries and allies curbed output to ease glut concerns. 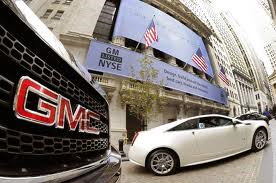 Nevertheless, price gains have been capped by record American output, expanding stockpiles and the U.S.-China trade war. Talks between the world’s two biggest economies later this week may provide the catalyst for crude to break out of its recent tight trading range. West Texas Intermediate crude for March delivery rose 19 cents to $52.18 a barrel on the New York Mercantile Exchange at 9:11 a.m. in Singapore. The contract fell $1.70 to close at $51.99 a barrel on Monday. Brent for March settlement declined 10 cents to $59.83. It broke below $60 for the first time in almost two weeks on Monday, dropping $1.71 to $59.93 on the London-based ICE Futures Europe exchange. The global benchmark crude was at a $7.94 premium to WTI. Frontier markets are poised to rise this year as they benefit from lower valuations and a “reasonably solid” economic outlook, according to Andrew Howell, a Citigroup Inc. equity strategist. Howell provided the view in a report released Wednesday. 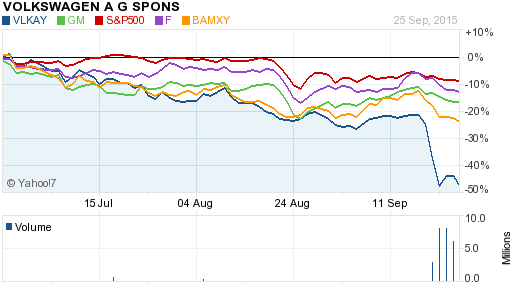 Any advance might be well received because these stocks have been through what can be considered a lost decade. The MSCI Frontier Markets Index rose just 9.5 percent from 2009 through 2018. 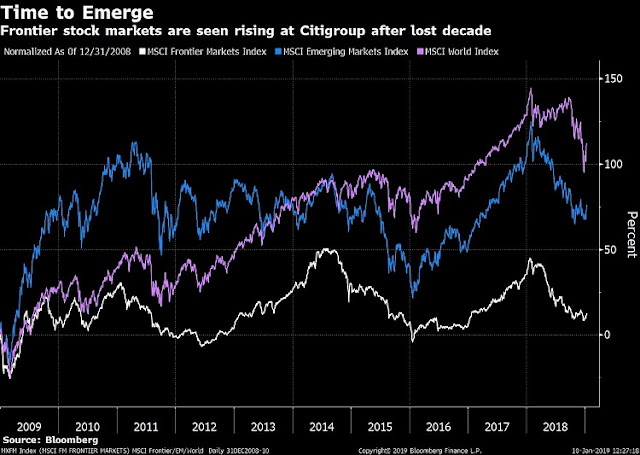 During the same period, the MSCI Emerging Markets Index added 70 percent and the MSCI World Index of developed markets climbed 112 percent. CRUS Cirrus Logic 1.93B ; Austin, Texas-based; Apple supplier; makes audio integrated circuits and microphones used in smartphones. Apple represents 75% of company's revenue. That is the highest percentage among Apple suppliers, according to FactSet. SWKS Skyworks Solutions 11.29B : Woburn, Mass.-based; The company makes radio frequency chips used in Apple's iPhone 6, Samsung's Galaxy GS5 as well as many other wireless devices. Gets 40% of its revenue from Apple. AVGO Broadcom 94.9B; San Jose, California-based; top supplier to both Samsung and Apple. QRVO Qorvo 3.72B: North Carolina; radio frequency (RF) solutions for mobile, infrastructure, and aerospace and defense applications. 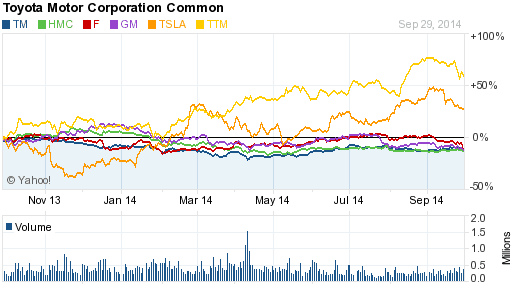 JBL Jabil Circuit 3.84B: contract manufacturer; gets about 25% of its revenue from Apple. NXPI NXP Semiconductors N.V. 22.5B: Netherlands-based; the world’s number one supplier for small-signal discretes; will supply the near field communications (NFC) module and secure element NFC booster chip. NFC is a set of standards for smartphones and other devices like the Apple Watch to establish radio communication with each other by touching them together or bringing them into close proximity, usually no more than a few centimeters. InvenSense (traded as NYSE:INVN ) acquired by TDK Corporation for $13.00/share in cash Dec. 2016. 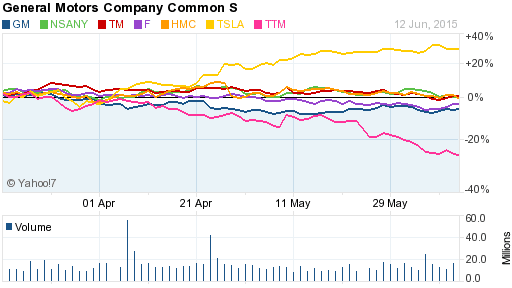 Broadcom Corp. (traded as Nasdaq: BRCM) ; California-based; top supplier to both Samsung and Apple. Acquired by Singapore-based Avago Technologies (AVGO) for $37 billion in Feb 2016. Avago took the Broadcom name after the acquisition. The ticker symbol AVGO that represented old Avago now represents the new merged entity. The Broadcom Corporation ticker symbol BRCM was retired. Jan 9, 2019: Apple (AAPL) will cut production of its three new iPhone models by 10% in the January-March quarter, the Nikkei Asian Review reported Wednesday. Last week, Apple shares tumbled after the tech giant announced disappointing iPhone sales and a sharply lower revenue forecast for the holiday quarter. The Nikkei said Apple has asked suppliers twice in the past two months to trim planned production of the iPhone XR, XS and XS Max. The latest request was reportedly made before last week's announcement. The Nikkei reported the move would reduce the total number of iPhones made this quarter from the previously estimated range of between 47 million and 48 million, to between 40 million and 43 million, or more than 20% less in terms of year-over-year quarterly production. Jan, 2019: Apple's latest iPhone models are seeing huge discounts from retailers in China. The technology giant recently revised its first quarter sales forecast downward, putting a large part of the blame on a slowdown in the Chinese market. Experts said a mixture of a poor pricing strategy and a lack of exciting features compared to local rivals like Huawei has led to the newest iPhones' weak performance in China. Apple's 512GB iPhone XS Max, the most expensive of the new models, costs $1,499 in the U.S. But in Asia's largest economy, the un-discounted price is 12,799 yuan, or nearly $1,900 — a more than 26 percent premium. 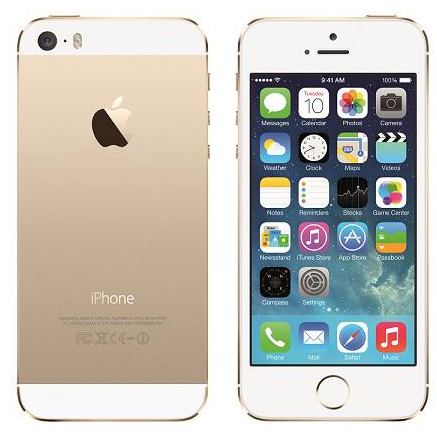 Other variations of the latest iPhone models have similar price premiums in China. Jan 2, 2019 : (source) Reportedly, Apple is collaborating with Sony Corp.(SNE) to deploy 3D cameras on iPhone XI in a bid to revive dwindling iPhone sales globally. The company plans to leverage Sony’s long-range 3D Camera based on Time of Flight (ToF) technology.This move is expected to enhance iPhone’s photography, security and gaming features, which will help in luring more customers. Further, it will enable users to precisely map objects in 3D and focus on every part of the picture up to five meters. Moreover, it can also be used to track objects in the dark. Dec 2018: Apple (AAPL)announced they’ll no longer disclose iPhone sales, a major metric of business health for investors and analysts. What does it mean? : Prices a derivative based on the assumption that it is riskless and that there is no arbitrage opportunity when it is priced correctly. Importance: Helped create the now multi trillion dollar derivatives market. It is argued that improper use of the formula (and its descendants) contributed to the financial crisis. In particular, the equation maintains several assumptions that do not hold true in real financial markets. The Black-Scholes (1973) was originally formulated to price European-style options, and does not account for dividend payment and early exercise. The Cox-Ross-Rubenstein Binomial model (1979) is a variation on the original Black-Scholes. The Barone-Adessi & Whaley, or "Whaley" model (1987), accounts for early exercise of call options due to dividend payment and is widely used among individual investors for pricing American-style equity options. Marc Leder, left, and guests attend a 2015 benefit in the Hamptons. Over the past 10 years, Sun Capital has taken five companies into bankruptcy while leaving behind debts of about $280 million owed to employee pensions. During the period when these five companies filed for bankruptcy with underfunded pensions, Sun had investments in more than 80 companies.